Fully furnished detatched 2 Bedroom 1 Bath Casita. department stores, lots of restaurants, Gold's gym and a major mall. available upon request. We have many returning visitors! Owner is a licensed real estate broker in Arizona. Born and raised right here in Tucson. We have raised our 3 children and now have 4 beautiful grandchildren. I designed the casita in 2003 in a way that would be functional, enjoyable and as private as possible for our guests to enjoy. I own and operate a local banquet hall & wedding chapel and have also been in the real estate business for nearly 20 years. I enjoy both jobs and meeting new people. In my spare time I play volleyball whenever possible. This property is very convienent to just about everything anyone would need but because it shares a 1.3 acre lot with the main house it feels like it is in a very rural setting and you get the true feeling of living in the desert without being too far from town. Located less than a mile from major shopping, dining, cinemas and more. Bring your best friend and take long walks on the paved streets. Gorgeous desert surroundings with daily visits from quail, rabbits, sometimes a bobcat or javelin and beautiful Catalina mountain and sunset views. Totally detached casita with its own driveway and privately fenced yard. Casita feels like its in a very rural setting although it is less than a mile from major shopping and dining. Towels, washcloths, hand towels, dish towels. Everything you need. Couch with large storage ottoman. Drop leaf table for 4 that will extend for up to 6 people. Complete with all the necessities. You just need to bring the food. Ramp to the front door and interior bedroom and bathroom doors will accommodate wheelchair. Bathroom is not equipped with hand rails. Not perfect for wheelchairs, but definitely do-able. 2 Bedrooms (1 King & 1 Queen bed) 1 Bathroom with shower (towels provided) Air Conditioning Family room Wireless internet connection at no additional charge! Cable TV 32' Flat panel wall mounted TV DVD player Kitchen (with all the necessities) Refrigerator Oven/Range Cofee maker Microwave Toaster Popcorn maker Washer/Dryer Ironing board & iron Covered patio Gas BBQ Grill There are 2 public libraries within a few miles. Trader Joes and many other grocery stores within 1-2 miles. Gold's Gym less than 2 miles away! Don't see something you need, just ask! This is a very comfortable house in a quiet neighborhood, but close to many restaurants, stores, and activities. Thank you for the review. Please let us know how we could have improved to get a higher rating. We spent the month of January at the Casa Del Sol. We liked the setting, being able to view the sunrise and sunset daily. The casita offered us complete privacy and had all the amenities we needed for our stay - and we made use of most of them. We would stay again. 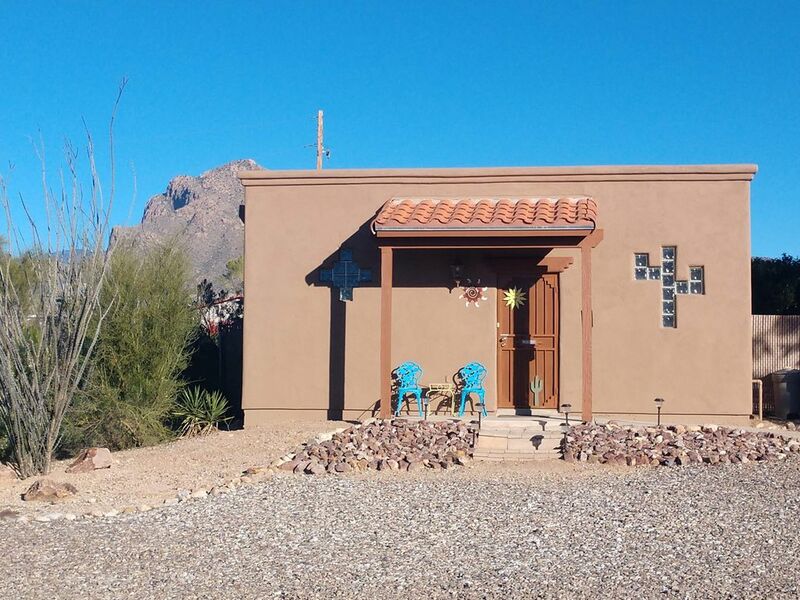 Casa Del Sol is a tiny super fun house located in the desert's foothills. We liked it so much that we rented it first in May 2016 while presenting at a scientific conference, and then again in April 2018. Sit on the balcony and enjoy the orange sunset, bunnies, and bats. A huge Walmart as well as Safeway, plus numerous local restaurants and services nearby and easily accessible by car. Go visit the downtown zoo or the Desert Museum--both very entertaining. Mexican food around is obviously genuine and so good. The owner Deanie will help you with anything you need and is easily reachable anytime. I actually stayed in owner's 1-bdr casita for about 5 weeks. Everything was perfect. It was immaculately clean and I never saw any desert critters (e.g. Scorpions). The casita was very spacious with a nice tv, sectional sofa, comfortable bed, washer/dryer, gas grill, covered patio, and fenced pet area. Very ample parking right out the front door. Owner very non-intrusive, yet responsive. My gas grill tank ran out of gas and she replaced it within hours. Casita came well stocked with the reasonable request that you leave it stocked for the next guest. I highly recommend the 1 bdr if you and maybe one other guest are staying in Tucson. Small pets considered with approval (I brought my 8-pound hypoallergenic yorkie with me). The casita is located in an established neighborhood-type area very convenient to shopping, grocery stores, entertainment, and I-10. Advanced payment was easy via PayPal. We needed a place to stay while we found our retirement home in Tucson. This VRBO fit the bill, particularly since we have two mature beagles. We looked at many properties in this NW area, but, of course, we found our new home on the NE side. All of the amenities were present and in working order as described. It is older and there can be improvements, but overall it is a well-maintained property. Deanie really gives you privacy even though she's next door, but when we needed her, she responded. The air conditioning went out during a heat wave in May, of course on a weekend, but Deanie had her busy repairman there and it was fixed in a few hours. Great customer service! Our only real complaint was finding some dirty dishes in the cabinets and a dirty BBQ (that was almost brand new). This falls to the previous renters and not the owner as I can see how these could be easily missed during a interim cleaning. We would definitely recommend this VRBO. We have some of the best golf courses in the United States! Great hiking trails surround the entire Tucson valley. Karchner Caverns - Approx. 75 min. Colossal Cave - Approx. 45 min. Sabino Canyon - Approx. 25 min. Catalina State Park - Approx. 10 min. San Xavier Mission - Approx. 30 min. Desert Museum - Approx. 45 min. Old Tucson Studios - Approx 40 min. Tubac - Approx. 35 min. Biosphere II - Approx. 30 min. Titan Missle Museum - Approx. 35 min. Pima Air Museum - Approx 35 min. Cleaning fee is based on double occupancy. Extra $25 per person per stay fee is added for more than 2 guests. We would prefer payment by check vs. credit card but understand if that is your only option. Great location! Feel like your in a rural area when your actually blocks away from shopping, dining and more. Get the true feel of living in the desert with views of the cottontails, coyote, quail, bobcats & Javelina's traveling through. (They are fun to see, but never get close enough to worry about) I have lived in this area for 25+ years although my grandparents lived here for 30 before that. Its a very safe area and I wouldn't want to live anywhere else.